Ouachita Baptist University will present its 20th anniversary production of A Festival of Christmas on Nov. 30 and Dec. 1 at 7:30 p.m. inJones Performing Arts Center on OBU’s Arkadelphia campus. Ticket prices are $10 each with groups of 10 or more receiving a discounted price of $8 each. Admission is free for current Ouachita students. Dr. Gary Gerber, chair of the Division of Music, professor of music and director of choral activities, has served as musical director of A Festival of Christmas since coming to Ouachita in 2004. “The Festival of Christmas helps the community at large begin their Christmas season,” Gerber said. He noted that “the community at large” typically includes church groups of 20 to 30 people traveling from throughout the region for this highly anticipated event. Employing of students and faculty from throughout the School of Fine Arts was key when A Festival of Christmas began in 1992. 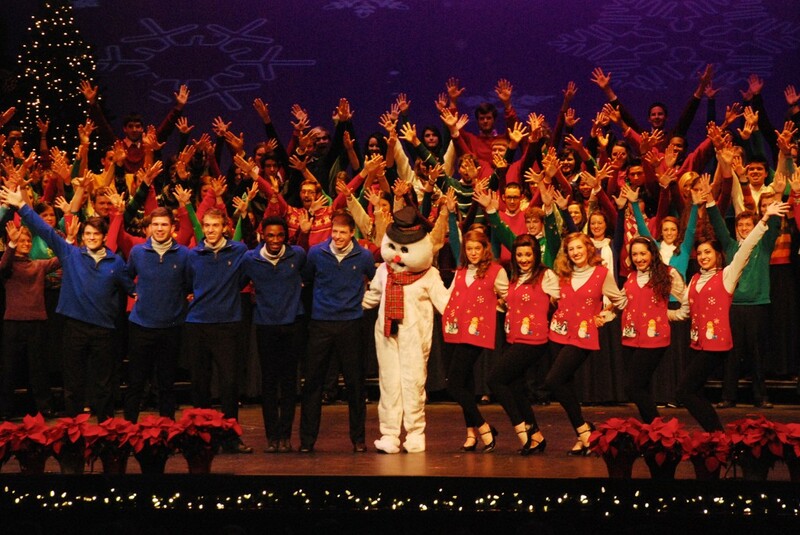 That tradition continues 20 years later as the annual Christmas show spotlights both the performing arts center and Ouachita’s talented students. A Festival of Christmas also showcases the two types of Christmas music that are heard throughout the holiday season. “The first half is familiar, secular songs,” Gerber said. He cited the opening song, “Merry Christmas, Merry Christmas,” which the audience may recall from the movie Home Alone 2. “In the second half we transition to sacred Christmas music,” Gerber added. The songs “Mary Did You Know?”, “Do You Hear What I Hear?” and “O, Holy Night” will be featured in the sacred second half of A Festival of Christmas. There are six performing groups featured in this year’s Festival of Christmas: Concert Choir, Ouachita Singers, Ouachita Sounds, Women’s Chorus and the Ouachita Pit Band, featuring members of the OBU Wind Ensemble. Gerber serves as director for both Concert Choir and Ouachita Singers. Mary Worthen, assistant professor emerita of music, is director of Ouachita Sounds. David Stanley, instructor of music, directs Women’s Chorus. Another group, the Movers and Shakers, will feature members of the Concert Choir who auditioned for the opportunity to provide visual entertainment, such as dancing and acting, during the first half of A Festival of Christmas. Holsclaw will serve as the stage director for A Festival of Christmas. Kaylee Nebe, a sophomore musical theatre major from Mesquite, Texas, will serve as choreographer for the show. Stacy Hawking, a freshman musical theatre majorfrom Sherwood, Ark., will be the choreographer for Ouachita Sounds.